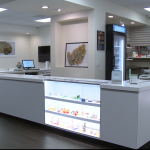 As cannabis moves into the mainstream, customers and industry watchers are expecting dispensaries to present themselves as professional businesses. The industry is evolving quickly, and it’s difficult for businesses to keep up. This post highlights three areas that can help your organization look, feel and act as professional as possible. You might have heard about the rocky relationship between cannabis and social media, how different sites are enforcing their policies, and what dispensary personnel can do to minimize the effects of these policies. Despite the obstacles, it’s a good idea to create social media accounts for your business. Establishing a presence on Facebook, Twitter, LinkedIn, Instagram and other accounts, proves to potential customers that you’re serious about serving them. The perceived amount of time to update pages often discourages small dispensaries, but you don’t have to post frequently. 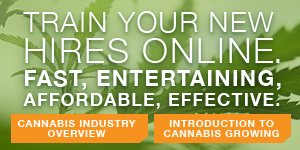 At the same time, post your business on the cannabis social media sites (like Leafly and Weedmaps) to help customers and patients find you on the sites catering to the industry. Post information about your products and services with the brand you want to project in the forefront of your mind. For instance, if your organization caters more to the elderly and sick, highlight non-smokables and patient success stories. On the other side, if your business provides edibles, post about the benefits and ease of indigestible cannabis. Build a website and keep it current. Don’t make the mistake that social media pages are all you need for an online presence. You should also have a functional, up-to-date website for your business. Consider user-friendly services like Wix, WordPress, Weebly or one of the many others that can easily build and launch your website. Then make someone on your team responsible for keeping the site current. An email presence is also important, so set up business email accounts for each of your key employees. Use professional addresses like jsmith@yourcompany.com (not CoolDude726@aol.com) for anyone who represents your business online. Typically, you can set up these addresses from the same service where you purchased your domain name or built your website. In addition, Google’s G Suite provides email and many other services starting at just $5 a month. This applies as much to your front-line employees and physical space as it does to you as a dispensary owner or manager. Your burden is higher because you set the tone for your staff. If you dress, act and conduct yourself professionally, employees will see that you expect them to be professional as well. Beyond being well-groomed and well-mannered, you can do other things to help keep your operation looking professional. Keep the exterior clean, bright and welcoming. The first impression of your business happens before the customer walks in the door. If your dispensary is legally allowed to display outdoor signs, make sure they’re visible, well-lit and indicate where to park and enter the store. Appoint someone to routinely examine the building’s exterior and parking lot to clean up and report anything broken or potentially hazardous. Each physical location and key employees should have business cards. These communicate to customers, partners and others that your dispensary is professional and your employees are professionals. If you’ve already taken the time to design a logo and brand for your business, designing a card is easy and less expensive with online services like VistaPrint, Moo and GotPrint. Ensure your employees look professional. A simple uniform, such as a polo shirt with a company logo, will help employees feel professional and confident. Also, customers will know who can assist them. By getting input on what the uniforms should look like, you can help galvanize your team behind your store, your brand and your mission. Even though employees may have joined the business as friends or family members, it’s time to start treating them like real employees. This starts with your Human Resources practices, including payroll, worker’s compensation, scheduling, benefits and hiring. While HR can seem daunting to a small business, consider cannabis-focused resources like Wurk or HighestReward to help you set up your system. Remember that budtenders are often the only representatives of your business that a customer will see. If they’re inexperienced, ignore legal regulations, or don’t follow store policies, it reflects poorly on the business. 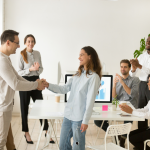 Making all employees high-quality representatives can be as easy as streamlining up your training and onboarding process. Consider hiring a training manager or an industry specialist like Cannabis Industry Institute to implement customized, efficient, scalable training for your business. Understanding how to track and use key data can help you solve problems and keep your business afloat. Data points—such as sales by product type, brand, time of day, employee making the sale, and profit points for each product—can help you foresee challenges before they happen. By doing this, you can reduce damage during hard times and capitalize during good times. Many point-of-sale systems offer data tracking, so take time to familiarize yourself with these features. Ask the vendor for additional training to help you get the most out of what you’re paying for. Also consider industry-specific services like Headset or BDS Analytics to maximize data tracking, analysis and execution. There’s always room to improve the professionalism of your business. By taking these few steps, you can stay ahead of your competition as the industry continues to mature. The investments you make today will pay off in the short-term but will also help your dispensary remain agile, efficient and business-savvy for years to come.